You'd never order Domino's pizza in Italian, so why are you asked to use Italian when ordering a cup of joe at Starbucks: a venti latte, a grande Frappuccino, a tall… alright, that one is in English. But how did the Seattle-based chain get those atypical cup-size names? Why isn't it just small, medium, and large? The answer isn't as straightforward as you might think. You may have never heard of Il Giornale, but it was the mini-coffee chain Howard Schultz, the founder of Starbucks, started in 1986. This was a year before he bought a tiny brand called Starbucks and turned it into a global juggernaut. When it first opened, Il Giornale had just three sizes, according to a Starbucks spokesperson: short, tall, and grande. (The much larger venti size was introduced at a later point.) This is all thanks to a fateful trip Schultz took to Italy in 1983. During this trip, Schultz became "captivated with Italian coffee bars and the romance of the coffee experience," the Starbucks website noted. In her book Grande Expectations, author Karen Blumenthal writes that "since the stores were designed around the concept of Italian coffee bars, [Schultz] wanted distinctive names" for the cups that would reflect that. She adds that Schultz also "wanted to convey a different image, something far more exotic than a simple cup of joe." So he used cups in a variety of sizes (much more rare at the time), and gave them atypical names (with a couple of words in Italian) to make them more distinct. The use of Italian on the menu didn't just stop at cup sizes.There were also menu items with words like doppio, macchiato, and misto on the Il Giornale menu, Blumenthal added. These are also all phrases that can be found on the current Starbucks menu. But what about "short" and "tall," two very English words? 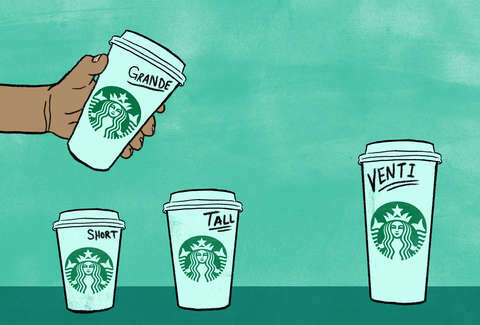 It is a question that has vexed many a Starbucks customer -- why the hell is a small called a "tall"? After all, no one is calling a guy "a tall drink of water" unless he's as tall as a Hemsworth brother. The answer comes down to space on the menu board, according to Melody Overton, who obsessively chronicles the coffee chain on her blog Starbucks Melody. The menu boards at Starbucks, for many, many years in the '90s, only had three sizes listed: short, tall, and grande, Overon noted. "So a short was considered to be a small, tall was medium, and grande was large." And then venti came in and changed the damn size game. 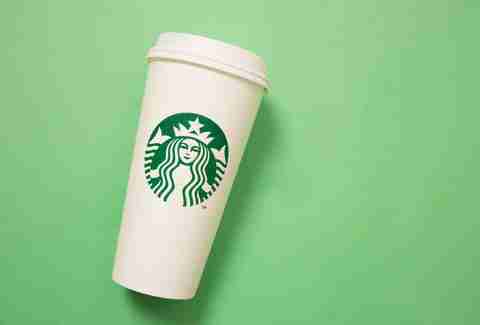 "When venti was added, short dropped off the menu boards," Overton says. "Starbucks decided that there wasn't room for four sizes." So short got the boot and tall became the new short, or small." Now, the short is back. Even though it's not on the menu boards still, you can order hot drinks in that 8oz size. Especially if you want one of the new holiday drinks, but don't want two full cups of it. These days, Starbucks also has a fifth size for cold drinks. Called the trenta, it holds 31 full ounces of ice-cold refreshment. So, there you go. Mystery of the strange Starbucks cup names solved. But it doesn't answer the other major Starbucks question: Why the heck can't its employees spell anyone's name right?